The perfect Caprese pasta salad for a potluck or summer bbq! 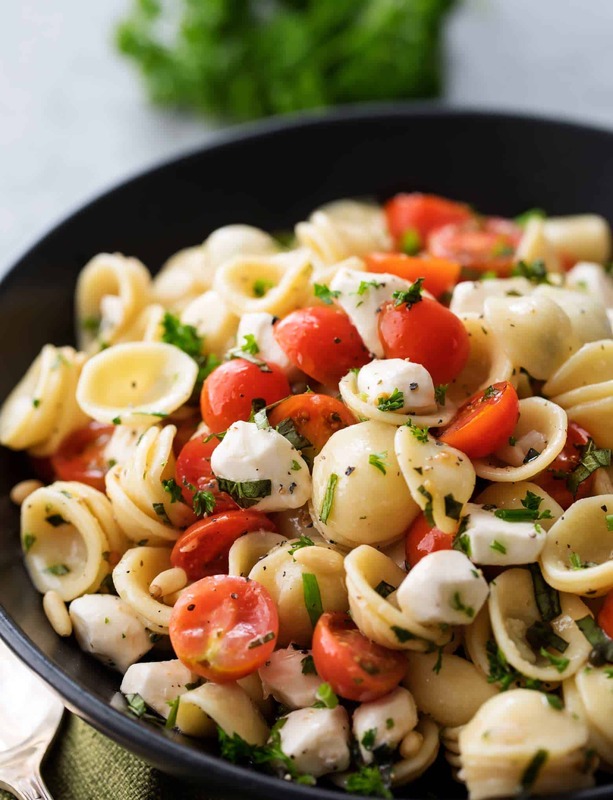 Caprese pasta salad made with juicy tomatoes, marinated fresh mozzarella cheese, fragrant fresh basil, and a mouthwatering homemade Italian herb vinaigrette! Pasta salad is an incredibly popular versatile side dish! Whether the salad is based in oil or mayo, it’s always a hit at potlucks. 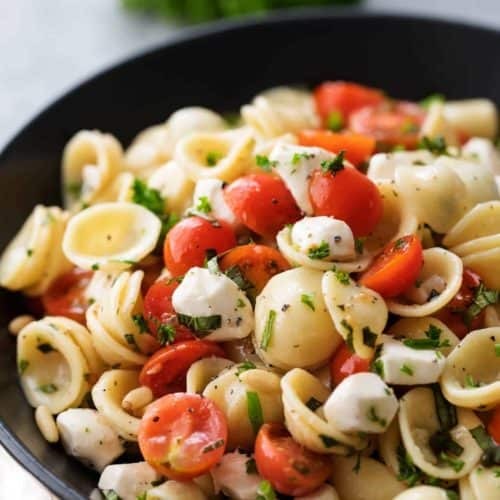 This version is a fabulous natural make-ahead dish and combines the classic American pasta salad with the Italian Caprese flavors! 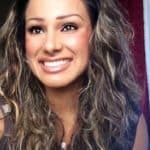 Hey guys, it’s Amanda from The Chunky Chef, a recipe blog that focuses on comforting family recipes, and Smart Skinny Recipes. 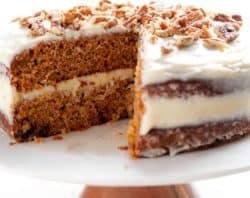 Healthy weight watcher recipes with bold flavors. 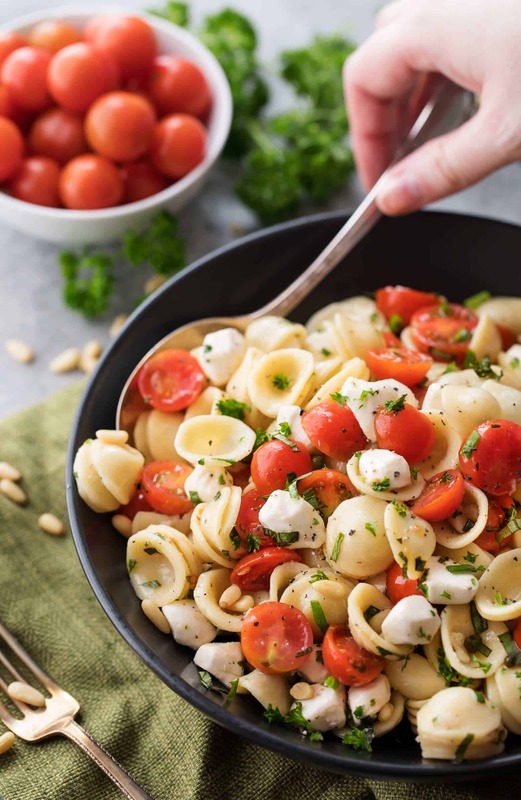 I’m a self-taught home cook who loves whipping up fabulous comfort food that everyone loves… like this caprese pasta salad! By definition, caprese is a salad comprised of tomatoes, fresh mozzarella and fresh basil. You may have seen salads like this on the menu at your favorite Italian restaurant. 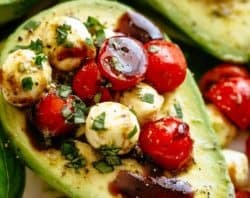 Some caprese salads also include a drizzle of a balsamic glaze or reduction, which is fabulously tasty! Can pasta salad be made ahead of time? Absolutely! In fact, in order for the flavors to all combine and round out, it’s best if you make pasta salad anywhere from a few hours to a day or two ahead of time. Personally, I always make my pasta salad the night before, reserve a little of the dressing, then give it a good toss with the extra dressing before serving. It makes it taste nice and fresh. Pasta – generally shorter cuts of pasta are used, like rotini, farfalle, or in this case, orecchiette. Vegetables – tomatoes, peppers, cucumber, olives, squash, etc. Protein – cheese, pepperoni, diced ham, etc. You can definitely mix and match to create a pasta salad you love! Use the freshest ingredients when possible. There are relatively few ingredients in this pasta salad (aside from the dressing), so using fresh and quality ingredients is key. Use ripe, juicy tomatoes, quality fresh mozzarella, and beautiful fresh herbs. Cook your pasta to al dente, according to the package directions. Each shape of pasta has a different cooking time, so check the package for the exact time. Once finished cooking, drain and toss with a bit of olive oil to prevent the pasta from sticking together. If possible, stir it several times as it cools to keep the sticking at bay. Reserve a couple of tablespoons of the vinaigrette and toss it with the salad right before serving to give a make-ahead pasta salad a fresh feel. 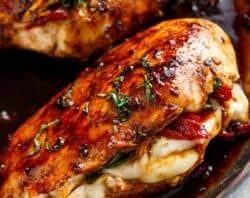 Speaking of the dressing, it does double duty in this recipe, as it’s also the marinade for the mozzarella! I hope you all give this caprese pasta salad a try, I’m sure you’ll love it! Hope to see you around The Chunky Chef and Smart Skinny Recipes too! 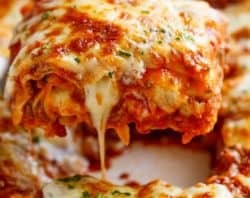 Looking for more pasta recipes? Try these! The perfect Caprese pasta salad for a potluck or summer bbq! 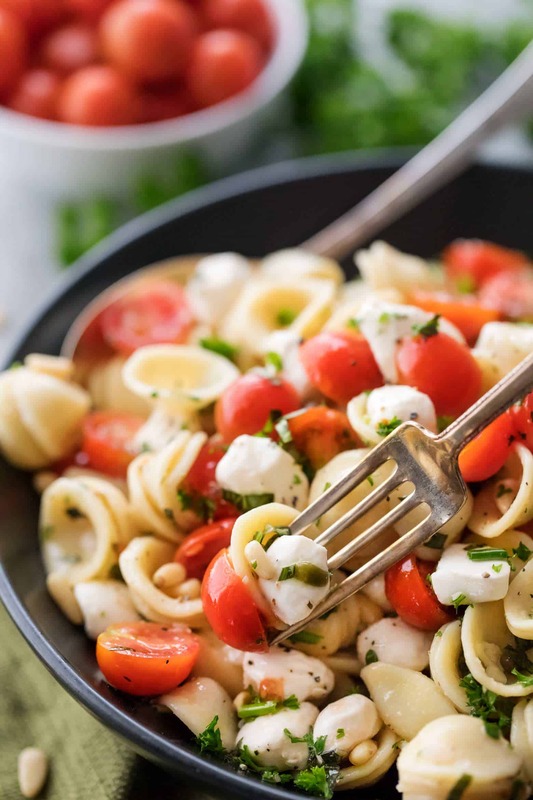 Caprese pasta salad made with juicy tomatoes, marinated fresh mozzarella cheese, fragrant fresh basil, and a mouthwatering homemade Italian herb vinaigrette! 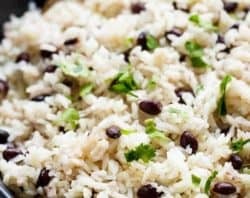 A versatile popular side dish! In a large mixing bowl, add dressing ingredients and whisk until well combined. Reserve 2 Tbsp of dressing and place in an airtight container and set aside. Add cherry tomatoes and fresh mozzarella to mixing bowl with the dressing and toss to combine. 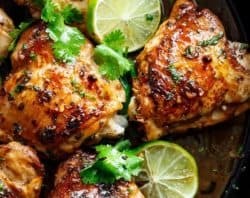 Let sit and marinate approximately 30 minutes. While the cheese and tomatoes are marinating, boil pasta according to package directions. Drain pasta and toss with a drizzle of olive oil. Let cool slightly. Add pasta to mixing bowl and toss to combine. Transfer to serving container, cover and refrigerate 1-2 days. Before serving, toss pasta salad with reserved dressing and serve. Pasta salad can also be served warm, right away after making it.